The secret to a happy and successful life resides in tireless personal growth, regardless of how difficult, frightening or devastating it may be. Soul-searching develops all the good qualities in a person, enrichening our lives with the most special kind of wisdom – to respond to good and the bad times with the same enthusiasm and fearlessness. 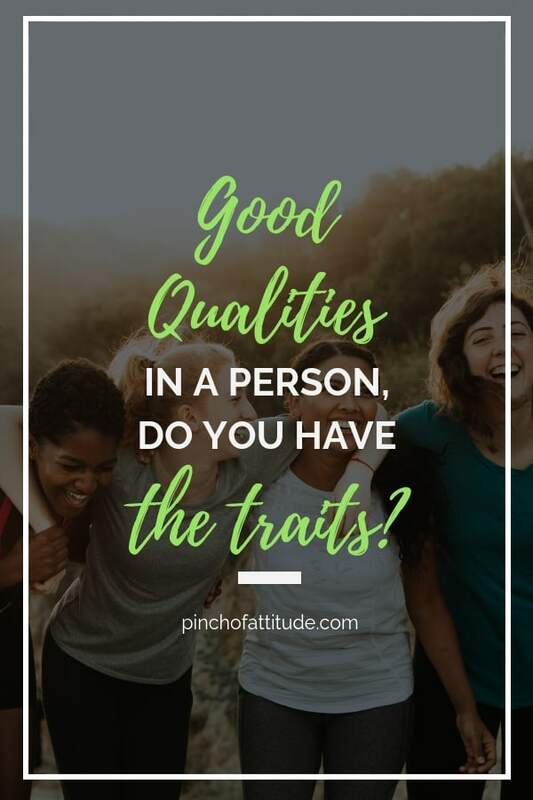 Having been through the ups and downs in my life and the opportunity to meet and to connect with various people, inspired me to put the list together of what I believe to be the ultimate traits of a truly good person. Some people try to fake it to fit in or to mislead others to get what they want but we all know that when nothing is from the heart, eventually the true color will show. Here is my ultimate list of good qualities in a person. Those who know how to make the best out of every situation need little but what’s already in front of them. Immensely insightful, these people find solutions in details that others overlook and see opportunities in situations that others deem as unpromising. Instead of holding back in life, they charge forward without any fear of regret. Their flexibility and a positive attitude can be learned, so take it slow and don’t worry: as long as you choose to focus on solutions and remember that all difficulties are temporary, the secret for a happy life will be yours. Some people make the world special just by being a part of our lives, though such people aren’t easy to come by. They are the helpers, the nurturers, the caretakers – always prepared to go an extra mile for those they cherish and love, these amazing people bring out the good in the rest of us too. You can easily recognize them, for their smile is always gentle and their love is unconditional. The greatest acts of love are done by those who are habitually performing small acts of kindness, no matter how cruel or unforgiving the life gets. No good deed passes unnoticed, so stay helpful and loving. We all have our cloudy days, but only the best of us can find the inner strength to make a compliment to someone when compliment’s due. It’s one of many good qualities in a person that we’ve regrettably forgotten all about, but the one we should learn to nurture and appreciate all the same. Pay a compliment to someone every single day, since this little exchange of encouragement and support can immensely affect both yours and the other person’s life. The first time you try it, you’ll come to realize that giving compliments isn’t something that can make your struggles bigger, but exactly the opposite – an occasional act of compassion towards other people can actually ease them. While most of us take what we have for granted, mindful people appreciate not only the things that deserve our gratitude the most but also the things that others regard as utterly insignificant. And, if you think about it, it’s exactly those things that have the highest value in life. To develop this superpower quality, one should pause to appreciate them all. Keep changing your attitude until you comprehend just how beautiful the world is, and how lucky we are to be a part of both the good and the bad that reside within everyone’s life. A big number of good qualities in a person are inherent; they get passed on from one generation to another until they finally find their place in our parents’ DNA. From there on, they become a piece of ourselves and our everyday lives, partly thanks to our genes and partly to our upbringing. That’s why happy and successful people never forget about their parents, regardless of how loving, present or wise they were in the past. Even if they’ve made some decisions that you’re still disappointed, hurt or made about, your parents are nevertheless a huge part of who you are today. Besides, there might be some things you can teach them now that you’ve grown into a self-sufficient and thoughtful adult. Forgive them for their mistakes and pick up the phone – there’s nothing that a long and honest conversation cannot heal. Nothing in relationships is as crucial as honesty, and we’re not exclusively talking about revealing all those dirty little secrets and white lies that most couples seem to be harmless. Like all other types of dishonesty, they stand in a way of genuine connection, but lying to oneself is still the most dangerous thing of all. A truly honest person would never claim they’re okay when they’re actually not, neither would hold secret grudges or hide behind false pretenses. Being truthful with oneself means being strong against all odds, and treating each inner conflict, doubt, and insecurity with the attention it deserves. It’s only then that we can be completely honest with the person we love because it’s only then that we can come to terms with what feels right and what feels wrong. Honesty in a relationship gives us the insight and strength to be rational and objective while addressing our problems and voicing our concerns. For both themselves and those around them, fulfilled people never hesitate to go the extra mile. If passion is the trait that guides us through life, doing more than what is required is both easy and rewarding. When it comes to success, this is arguably the most important of all good qualities in a person. Why? Because the intention beats the odds! Whenever you go beyond the call of duty, you raise the likelihood of achieving what you want. This quality never comes alone, but develops together with patience and determination – whatever it is you want to accomplish, this trifecta of traits will make you unstoppable. Being kind and caring no matter the circumstances, good people are always good listeners. Not only are they able to put other people’s problems in front of their own and sit quietly by their side while they talk, but they are also understanding of others’ mistakes and wrongdoings. What makes them so irreplaceable as friends are that they never judge, but pay attention, take notes, and give thoughtful advice in return. Instead of pretending to listen, they actually hear the words others say, taking them for what they truly are. For all of our cries for help, they have a comforting shoulder to lend. Among all good qualities in a person, patience is the quietest one. You can detect it only if you look really hard, and develop it only if you let go of all frustrations. The road to perseverance might be long, but becoming more patient in your everyday life is certainly worth the trouble. Patience opens all doors – it teaches us to stay calm in face of adversity, while simultaneously giving us the power to overcome even the biggest of obstacles. Since they never stop learning and growing, patient people enjoy better mental health and achieve higher goals, which is a reason enough to join them. Being reliable is not only a rule of social character; it’s what shows people that you respect and care about them, thus helping you build trust with anyone you meet. With their reputations intact, reliable people feel no pangs of conscience or remorse for what they promise but don’t deliver. Though trustworthiness is one of the most admirable good qualities in a person, this personality trait isn’t at all so difficult to acquire – whatever you say, simply stick to your word. Doing so gives you a good night’s sleep and allows you to base your relationships on trust and loyalty, which are the two greatest gifts you can receive in life. Make a list of everything that seems trivial, since those are the things that we should appreciate the most. Start with your family and friends, your health and your mind, and don’t forget to include the warmth of the sun and the gentles of snowflakes. The sooner you acknowledge that every little thing counts, the sooner you’ll get to feel content about what’s in front of you. We often forget that a happy life is all about simple pleasures – every once in a while, remember to take a moment to smell the roses and dance in the rain. Being a kind person isn’t such an admirable feat when the day is sunny and the skies are blue. It’s in all those hard times that our true nature is revealed, separating average, egoistic people from exceptional human beings. When the world is frightening, thoughtful people remain brave for the rest of us. Besides, people who are always thoughtful towards others’ feelings know that positive reinforcements spark creativity and build trust between two souls. Kindness doesn’t kill, compliments are entirely free, and what goes around always comes around. Everyone’s favorite kind of person is the one who smiles in the face of adversity. It’s truly phenomenal how a little beam on somebody’s face can shine a light on another person’s cloudy day! These are the people who know how to make us laugh even when life isn’t funny at all, which is pretty much the most important of all good qualities in a person. But smiling isn’t solely about making other people feel better – it’s also a powerful way to shift your own perspective, shake off unfounded worries, and convince yourself that everything’s fine with the world. It is another, more elevating way of showing your teeth to the demons that surround you. Practice it regularly, especially when it’s hard, and you’ll see just how soothing and empowering it is. Generosity transcends the material by teaching us that giving is not about receiving something in return, but about the simplest, most humane exchange of all – the exchange of selflessness. If there weren’t for free hearted people, each and every one of us would be left alone in a world devoured by greediness. So, give something without expecting anything back. Do it once, and you’ll feel immediate satisfaction. Keep giving, and you’ll understand why generous people never lack anything at all, for no other personality trait can make you as fulfilled and grateful for all the things you already have. Another thing that generous people understand is that there’s no genuine gratification when the things you give to others or do for them are actually for your personal gain. If you are kind to others just because you want them to be kind to you, there’s no real exchange of selflessness there. It’s even worse when people ask for gratitude and praise in return, and not only because such behavior annulated the very act of kindness they’ve performed. More importantly, publicizing what they’ve done for others makes them if not false, then superficial altruists, and there’s no true happiness in that. Rare are the things that can make a person as self-actualized as inspiring others. In the ancient book of life, lifting your own spirit by lifting somebody else’s first is one of the oldest tricks. Such qualities in a person are not easy to find, though – it takes a whole lot of self-control and unselfish concern to develop them. Still, there’s nobody stopping you from trying but yourself. Those who uplift everyone around them are much more than people pleasers, and the only thing it takes is to seek contentment on a personal level and practice empathy in relationships with others. The two are inseparable, so just be yourself and share your magic with the world. Never take anything for granted. In this complicated and confusing world of hours, every single thing has its unique purpose, the one that affects your life in mysterious ways. Regardless of how small and usual, they might be, the things we take for granted are the very things that make us who we are. In The Greatest Miracle in the World, Og Mandino offers a beautiful example of how most human beings take what they have for granted. Though fictional, his story about a man who was complaining about having no shoes until the moment he met a man with no legs is a reminder to us all to take every next day as a gift. Happy and successful people enjoy other people’s happiness and success. Halfway through our tireless race to the top, the human kind has forgotten that we’re not here to compete, but to grow. The truth is simple enough – a top is a lonely place, and there’s no winner in a contest against our kin. Just imagine what we could do with the time and energy we waste on always being a little bit better and a little bit happier than those around us! Being a part of somebody’s success story is so much more fulfilling, and that’s the first lesson that people who like to see others happy learn. All good qualities in a person come from the same place – a fearless commitment to inner growth. As people outgrow themselves, they gain a unique ability to step out of their depths and reach out to others. It’s a long and painful process for sure, but our personal completion depends on it. Not everyone reaches the end of this road. Those who do grow caring and selfless, realizing that it’s up to them to give their help and support to others who are left behind. Often, they devote the rest of their lives to inspiring people to do well, which in return makes them even stronger and delighted. Since others’ achievements are theirs as well, inspiring people never grow jealous. The root to both envy and resentment is personal dissatisfaction and low self-esteem, which is something that self-actualized people overcome at the beginning of their path. Instead of envying others, mindful people remain focused on nurturing their own self-worth. If there’s something they desire but lack, they don’t blame other people for it – rather than comparing themselves with successful and happy strangers, they stay calm and work hard until they achieve it. What qualities do you possess? My husband always says to me, if you’re truly happy with your life, then there is no reason for you to put others down and use words that hurt others. What I have realized is that happy people don’t have the best of everything, but make the best of everything. Though it’s hard for me sometimes to see positive in people and situation, I have to ask myself “is it worth getting angry at?” and if the answer is no, then I’ll let it go. Wherever you are on your path to fulfillment, keep going until all of the good qualities that can be found in a person can be found in you too – at that moment, you’ll realize just how magnificent it is to be a growing human being. It is wonderful, Thank you for the words of wisdom! I’m so glad I found your website. Each one of your articles resonate with me deeply and I appreciate you sharing your inspirational advice. Thank you greatly.